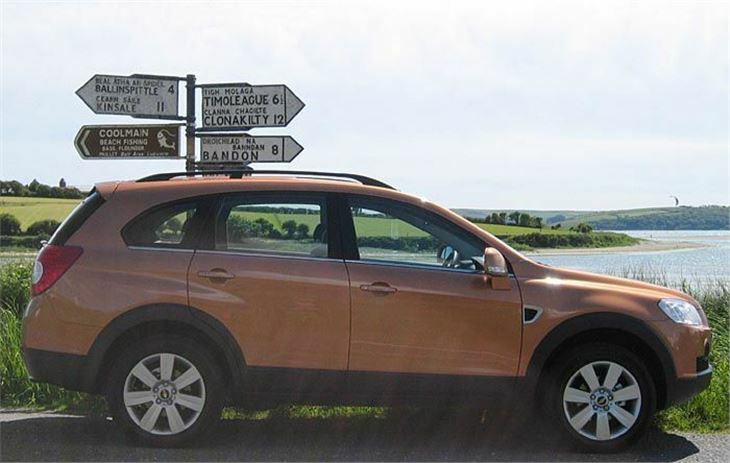 It's worth mentioning on the arrival of the Chevrolet Captiva that, despite the protestations of tree huggers, four-wheel-drive cars seem to be breeding at an alarming rate. Not too long ago the Vauxhall Frontera had the ‘Sports Utility Vehicle’ niche pretty much to itself. And if you wanted something bigger you could have a Discovery, a Shogun or a Range Rover. 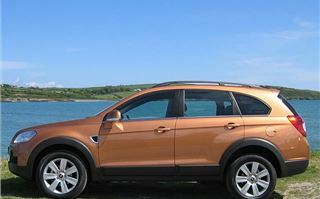 Then along came the RAV-4, then the CR-V, then the Freelander. 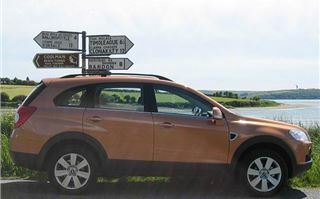 Audi Allroad, Audi Q7, BMW X3, BMW X5, Cadillac SRX, Citroen C-Crosser, Daihatsu Terios, FIAT Panda 4x4, FIAT Sedici, Honda CR-V, Hyundai Tucson, Hyundai Santa Fe, Hyundai Terracan, Jeep Compass, Jeep Wrangler, Jeep Cherokee, Jeep Grand Cherokee, Jeep Commander, KIA Sportage, KIA Sorento, Land Rover Freelander, Land Rover Defender, Land Rover Discovery, Lexus RX, Mazda CX-7, Mercedes ML, Mercedes GL, Mitsubishi Outlander, Mitsubishi Shogun, Nissan Qashqai, Nissan X-Trail, Nissan Murano, Nissan Pathfinder, Peugeot 4007, Porsche Cayenne, SEAT Altea Freetrack, Skoda Octavia Scout, Ssangyong Kyron, Ssangyong Rexton II, Subaru Forester, Subaru Outback, Subaru Tribeca, Suzuki SX4, Suzuki Jimny, Suzuki Ignis 4GRIP, Suzuki Grand Vitara, Range Rover, Range Rover Sport, Toyota RAV-4, Toyota LandCruiser LC, Toyota Landcruiser Amazon, VW Tiguan, VW Touareg, Volvo XC70, Volvo XC90. That’s a very crowded market for GM to launch a new 4x4 into. 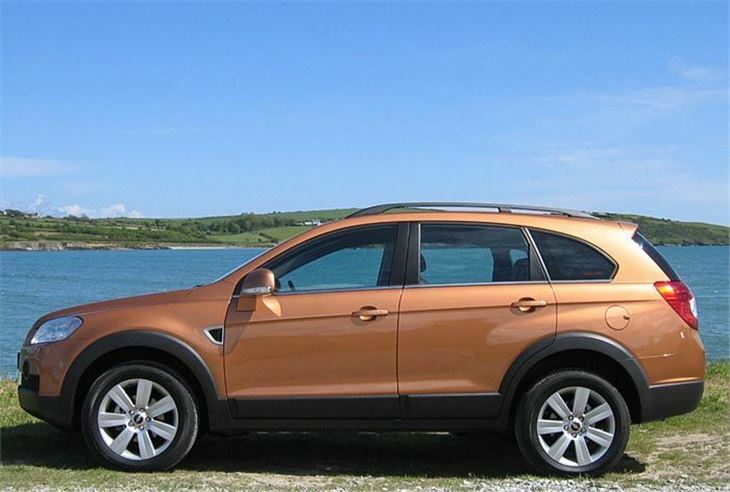 With Chevrolet badges it’s called the Captiva. 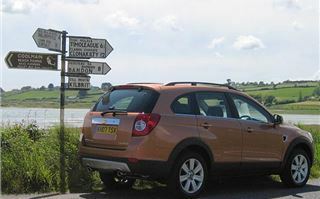 With Vauxhall badges the Antara. So is it any good? The range kicks off with a fake 4x4 because the £16,995 2.4 litre petrol engined version is only ever two-wheel-drive. 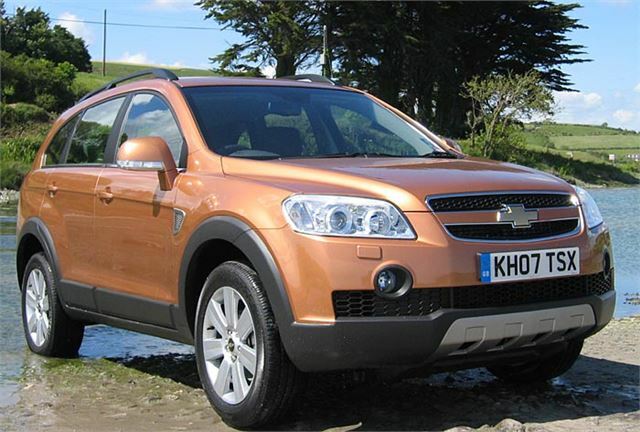 Then it jumps £3,000 to the cheapest four-wheel-drive, which also comes with a new 2.0 litre diesel engine. To get 7 seats you’re into £21,140. To add an automatic transmission, £22,230. While top versions are £23,740 for the Barcelona box and £24,920 for the auto. They’re good looking. 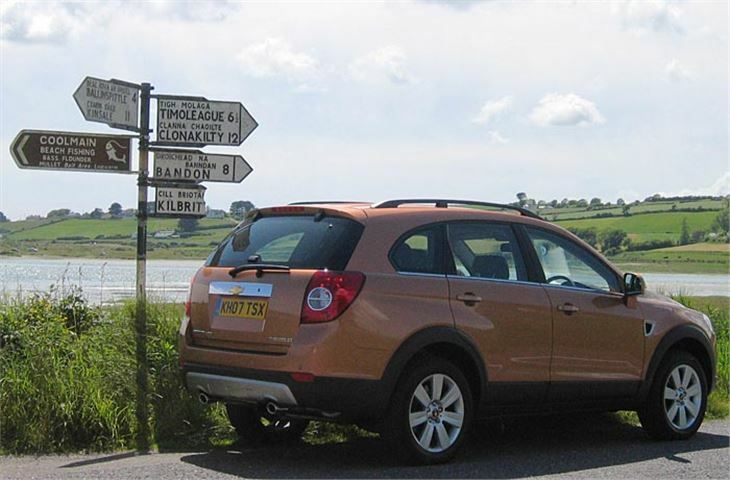 And they are proper 7-seaters, not 5 + 2 midgets like the Outlander, C Crosser and 4007. And suddenly that narrows opposition in the price range down from 55 vehicles to just one: the Hyundai Santa Fe 2.2 diesel auto. In the mid-range LT Captivas you get quite decent kit. This includes electric folding door mirrors, opening tailgate window, 8 speaker CD player with MP3/MP4 jack, aircon, ‘Level Ride Suspension’, automatic all-wheel drive, 17” alloy wheels, switchable ESP, hill descent brake control, front fogs, leather covered steering wheel, refrigerated glovebox, trip computer and rather nice, very comfortable woven fabric seats. 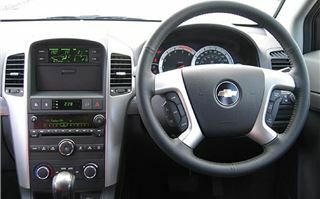 But slap in the middle of the otherwise nice-looking dashboard is what looks like it should hold a large satnav screen, but instead is a damped lidded storage box. Curiously, if you specify satnav as an option, the screen for that sits on top. We drove a 5-speed automatic top-spec LTX version first, on 18” wheels, and soon learned not to expect it to handle like an X-Trail or a new CR-V. It’s not quite old-school 4x4 because it does have all independent suspension. I’d say it’s most similar in its handling characteristics to the Hyundai Santa Fe, though it pitches and bounces more. Not a disaster, but by no means the last word in 4x4 sophistication. And with the autobox not exactly a ball of fire. Overtaking has to be carefully thought about and planned rather than simply rushed into. The manual is livelier, of course, because you have more control over the gearchanges and no torque converter slop. And it’s geared at 25mph/1,000rpm, which makes for reasonably peaceful cruising and the ability to tow without horribly low 1st and 2nd gear ratios like the Santa Fe manual. Ride quality and the ability to bounce over kerbs and pot-holes on the smaller 17” wheels with deeper profile tyres did not seem noticeably different. 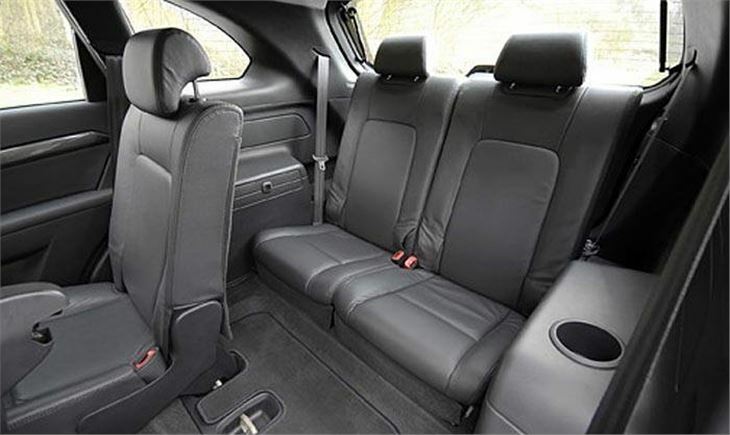 And because you can get your toes under the seat in front, the back seats genuinely take two adults. We watched a bloke who must be all of 6’ 4” get in there and he reckoned he could tolerate it for half an hour. Shorter adults could probably do a couple of hundred miles. 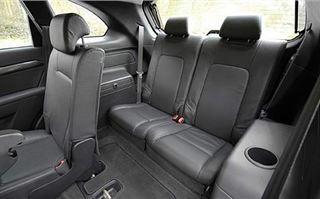 Unlike the Mercedes GL, both sides of the 60/40 split middle row seats double-fold so children an easily be corralled into the rearmost seats without having to step out into the road. That small but significant fact puts it firmly on the school run shopping list. Just one final point. Though the press pack told us CO2 emissions of the diesel automatic are 233g/km, it has been re-chipped to get it down to 224g/km. So it just squeaks into the sub-£400 annual tax bracket from next year. All Captivas are Band F, so £205 this year rising to £215 by 2009-2010.